This is one of the best all-around packages of filters and transitions on the market. 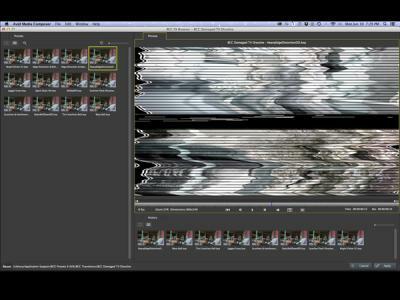 BCC 9’s FX Browser previews variations to the Damaged TV Dissolve transition. Boris Continuum Complete remains the flagship effects package for Boris FX. With each new version, Boris FX makes it better, faster and even more useful. BCC 9 was recently released for Avid Media Composer, Sony Vegas Pro and Adobe After Effects/Premiere Pro. Versions for other hosts will follow later in the year, including one for Apple Final Cut Pro X/Motion 5 and the OpenFX architecture of Blackmagic DaVinci Resolve 10/11. This is a two-year effort to build on BCC 8, which was released in 2012. 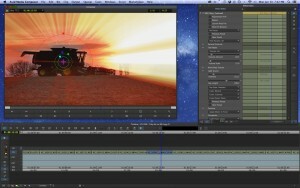 BCC 8 for FCP X/Motion shipped last year. While new filters are always fun, the two big changes in BCC 9 are OpenCL and CUDA acceleration, and the addition of the FX Browser window. Boris FX claims as much as a 2x improvement in rendering speed with some filters compared to BCC 8 (tested on Avid Media Composer running under Microsoft Windows). The FX Bro wser is new for Continuum Complete. While it’s not unique to have a filter browser within an effects package, this one has an edge over its competitors in that the clip is displayed in a viewer. You can play or scrub through the clip and sample the various filter presets. You aren’t tied to a default thumbnail image or a single still frame of the clip that you’ve sent to the browser. Nearly all of the BCC filters and transitions include a set of presets. Many users simply apply a filter, use its default and tweak the sliders a little. In doing so, they miss the wide range of looks that can be achieved. 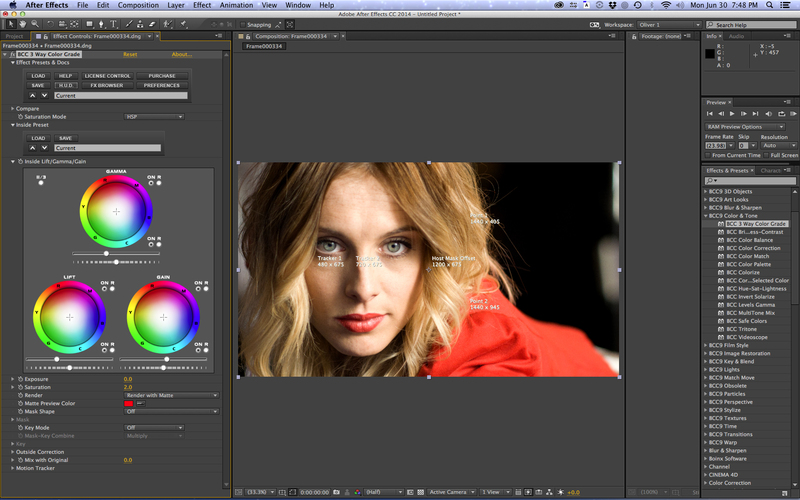 The new FX Browser window allows you to preview each of the Boris filter presets on your image. The left pane shows thumbnails for each preset. Click on one of the options and the viewer will display your clip with that preset applied to it. At the bottom of the browser is a history panel that shows the choices you’ve already reviewed. Once you find your desired look, click the “apply” button and you will return to the host’s effects controls. Adjust the sliders to fine-tune the effect to taste. 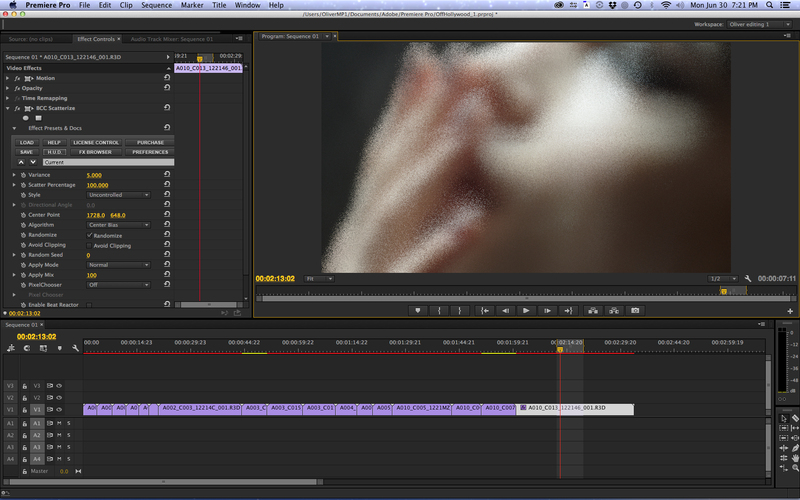 Another useful way to work with the FX Browser is to apply the standalone FX Browser filter to a clip. When you open the FX Browser, you’ll now see all of the effects categories and individual filters available within BCC 9. This is a great way to preview different filters when you just need creative inspiration. In the past, filters within the Boris Continuum Complete for After Effects version would also appear and work in Premiere Pro; however, the transitions functioned like they did in After Effects and not like a built-in Premiere Pro transition. Just like in After Effects, you would have to stack adjacent clips onto overlapping vertical tracks and transition between them. Now, with the changes in Premiere Pro CC and CC 2014, transitions in packages like BCC 9 behave as native effects—the same as in other NLEs. This means you can now apply a transition to the cut between two clips on the same track, just like a standard cross-dissolve. 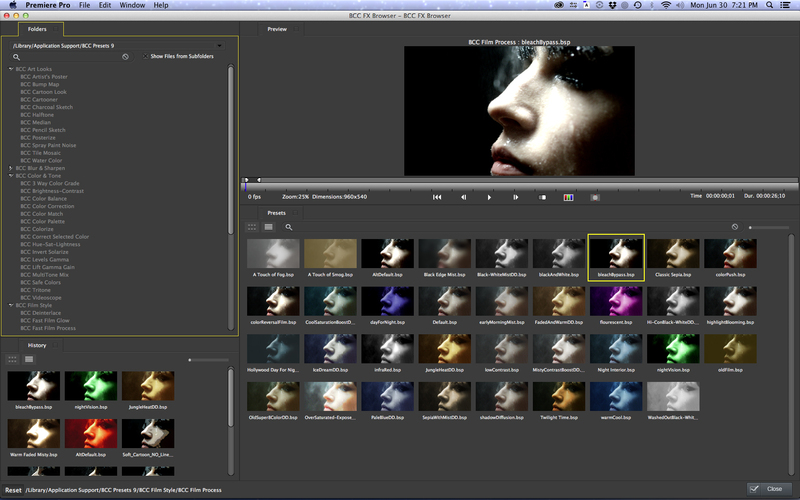 Just as with any of the filters, transitions may be previewed in the FX Browser. In addition to the sliders in the control panel, Boris Continuum filters feature on-screen controls (heads-up display or HUD) to vary filter adjustments. With BCC 9, some of the transition effects also gain appropriate HUD controls. 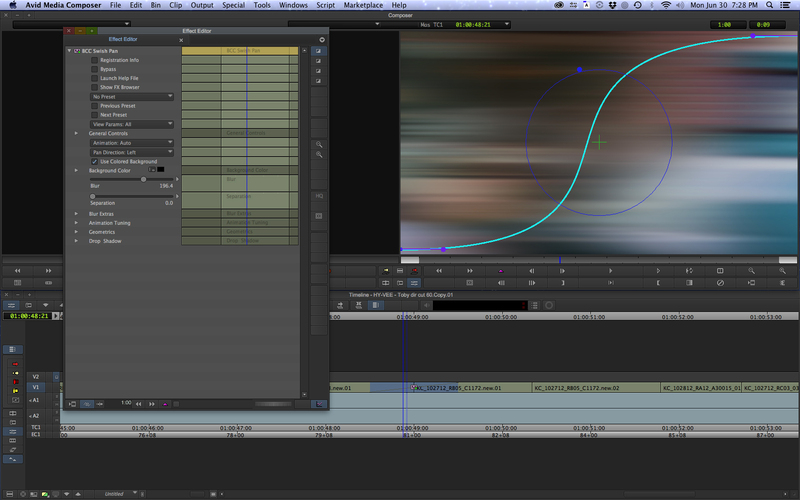 For example, overlay curves let you make nonlinear adjustments to wipes and dissolves without having to add keyframes. Over the last few versions, Boris FX has focused on improving the overall quality of all of the filters. The new BCC Vignette effect doesn’t just darken the edges of the frame; it also adds a slight defocus to more closely approximate real-world lens issues. The BCC Two-Strip Process filter is designed to accurately mimic the heavily saturated look of classic Technicolor films. The new BCC Lens Correction filter is mathematically designed to “unwarp” the characteristic wide-angle lens distortion of cameras like the GoPro. Some of BCC 9’s strength lies in its packaging of old favorites, such as its chromakeying tools. Many editors swear by the Boris keyers. Tools in this group include a matte choker and light wrap, which are typically used to finesse a key. Most editors end up applying a stack of these various filters to a clip in order to get the cleanest result. New with BCC 9 is a chromakey studio filter, which combines all of the keying tools into one panel. This capability debuted years ago in BCC for Final Cut Pro (“legacy”), but it’s now a part of all the BCC 9 versions. An improvement in this version is the addition of a built-in set of garbage masks to isolate the area needing to be keyed. While most of the filters and effects are consistent across hosts, there are some host-specific variations. For instance, in the AVX package for Avid Media Composer, each filter is more complex because Boris FX adds a geometry function for image transforms (scale, position, etc.) to most AVX filters. These are not standard clip attributes built into the native Media Composer architecture, like they are in After Effects, FCP 7/X and Premiere Pro. Unfortunately, since these are extra functions required to augment Media Composer, it makes the AVX set more expensive than the AE version. For FCP X, filters must be built for Motion and then packaged as Motion templates to be used inside FCP X.
BCC in general offers more controls within each filter than do competing effects systems. Nearly all BCC filters include Pixel Chooser, which is an internal masking control. If you want a filter to alter only the bright areas of an image, for example, you can use Pixel Chooser to mask the image according the luminance values and then the effect is limited to that portion of the image. Another feature unique to BCC is Beat Reactor, which lets you animate effects to music without setting keyframes. Let’s say you want a glow filter to pulse the intensity of the glow in sync with the beat of a music track. Simply enable Beat Reactor in that filter’s control panel, select and link the track that you want as a reference and adjust accordingly. Beat Reactor displays an overlay graphic of color bars representing the music. These bounce up and down like a digital VU meter in response to the track. The bars may be used for reference and hidden, or they can be rendered into the final output as an extra visual element. The Beat Reactor controls let you select the portion of this graph that is to affect the filter and the specific parameters to be controlled. Select a range that includes just the musical peaks and you’ll get a smaller variation to the changes in the filter than if you had selected the entire graph. Last but not least is a new online help system. Having trouble figuring out a filter? Click on the “help” button in the control panel to access a web page (stored on your computer) for tips and tutorials about using that effect. Boris FX continues to improve what has to be the best all-around editor toolkit on the market. Boris Continuum Complete 9 is cross-platform and covers the most popular NLEs. Now that Avid Media Composer no longer comes bundled with a full set of BCC filters, new Avid editors will certainly want to invest in this package. For Adobe Premiere Pro CC customers, it adds capabilities that far surpass what comes with Premiere Pro. Best of all, the single purchase for the Adobe version covers you for After Effects as well. Pros: GPU acceleration, new filters, support for popular NLE hosts. Cons: Avid version is significantly more expensive than the other versions of BCC 9. Bottom Line: This is one of the best all-around packages of filters and transitions on the market.